Barry & Ann Dimond White have quite the story! Ann has been an AGWM Missionary since 1986. Before Ireland, Ann and her late husband Larry Dimond and their two small children served their first term of missionary service in Zimbabwe. Ann's late husband moved to heaven in 2011 after a brief illness. Ann's ministry in Ireland continued on her own until November 2015 when she married Rev. Barry White, a Northern Irishman. Barry & Ann are privileged to continue to serve God in Ireland, now as a married couple. 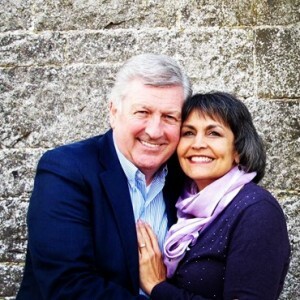 Ann has ministered in Ireland as an AGWM missionary since 1993, and Barry has ministered in Ireland and beyond over the past 40+ years. Ann & Barry minister together across the island (Republic of Ireland and Northern Ireland) preaching, teaching, mentoring and equipping leaders and pastors. They work with the AGI (Assemblies of God Ireland) in leadership roles in a number of churches across the island. They are passionate about training and developing young leaders to arise and take the churches forward across Ireland, North and South. This takes one-on-one mentoring, congregational church ministry, plus church ministry development. It's Barry and Ann's passion and privilege to encourage, raise and release young leaders into ministry. Thank you for your prayers, support and partnership to see the Kingdom of God expand across Ireland and beyond!